Treatments for glaucoma, including glaucoma surgery, are aimed at lowering the eye pressure (intraocular pressure) in order to prevent damage to your optic nerve. Unfortunately, treatment cannot repair any damage or reverse any visual loss that may have already occurred from glaucoma. Regular monitoring and subsequent early detection and treatment are therefore vital for the prevention of blindness from optic nerve damage. The aim of treatment is to lower the eye pressure in order to prevent further worsening of the visual field. The tunnel vision effect from advanced peripheral field loss is well demonstrated in the example above. How much lowering of eye pressure is required depends on how severe the optic nerve damage is. In general, normal eye pressure ranges from 8 to 21 millimeters mercury (mmHg). Ophthalmologists tend to start treatment if the pressure exceeds 30 mmHg. The ideal intraocular pressure level for most glaucoma patients is 14 mmHg or lower. Glaucoma surgery is generally considered as a last resort when eye drops and laser treatments have been unable to lower the eye pressure sufficiently to prevent further optic nerve damage. Surgery is generally reserved for those in whom eye drops and laser treatments are unable to lower the eye pressure sufficiently to protect the optic nerve from further damage. The traditional glaucoma operations (trabeculectomy, non-penetrating glaucoma surgery and glaucoma tube shunts are not commonly performed and are only required in 5% of those with glaucoma. More recently, a new class of glaucoma surgery called minimally invasive glaucoma surgery (MIGS) has been introduced. MIGS is normally performed in conjunction with cataract surgery and is suited for those who want to reduce the number of eye drops used. Multiple MIGS procedures have been introduced, including the iStent Inject, CyPass Micro-Stent and XEN Gel Stent, but are not yet widely available in all countries. These operations can be performed with a local anesthetic injection or with general anesthetic where you are put to sleep. The operation can take up to 90 minutes to complete. Continued use of intraocular pressure lowering eye drops is normally not needed following surgery in 50% of cases. You may need to use steroid eye drops for an extended period of time to reduce the amount of inflammation and scarring in the eye after surgery. Your ophthalmologist will discuss with you the surgery method that will best be able to reduce your eye pressure and keep the pressure stable. 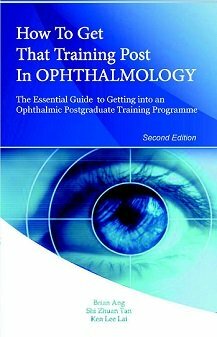 All the 3 traditional intraocular pressure lowering operations focus on the site of aqueous fluid drainage from the eye, specifically the trabecular meshwork and Schlemm's canal. 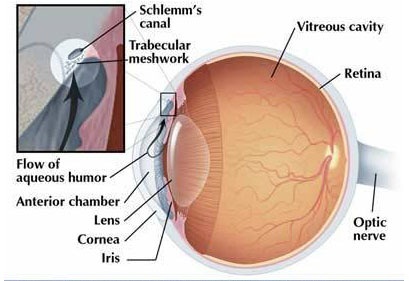 Trabeculectomy is the commonest surgical procedure to lower the intraocular pressure. The principle of trabeculectomy is to re-establish aqueous drainage by surgically creating a new channel in the eye, thereby lowering the eye pressure. This new channel is made by creating a trap door and making an opening (sclerostomy) through the sclera (white part of the eye which is also the protective outer wall). 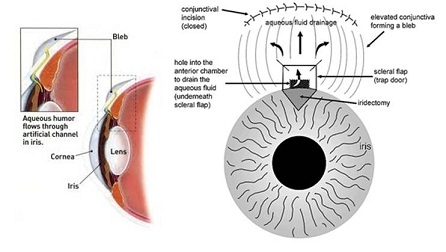 Aqueous fluid is then able to drain out directly from the anterior chamber via the sclerostomy to a space under the conjunctiva, called a bleb. The bleb is usually hidden under the upper eyelid. As the bleb may leak and become infected, lifelong monitoring is recommended. Diagram demonstrating how trabeculectomy surgery lowers the intraocular pressure. Non-penetrating glaucoma surgery is much less commonly performed, and is only suitable if you have open angle glaucoma. With this surgery, no actual channel or hole is created to directly drain out aqueous fluid (hence the term "non-penetrating"). The operation works by removing the thin membrane (roof of Schlemm's canal) that causes the greatest resistance to aqueous outflow, thereby allowing more aqueous to drain out and reducing the eye pressure. The benefits of having no direct channel is that there should be less risk of infection and hypotony (pressure that is too low for the eye). However, the pressure lowering effect may not be as good as with trabeculectomy. The 2 main non-penetrating surgery techniques are deep sclerectomy and viscocanalostomy. 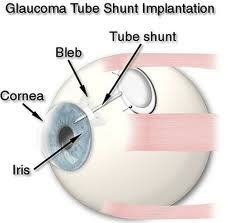 Drainage implants or glaucoma tube shunts are usually reserved for those in whom previous surgery was unsuccessful. These are 'plumbing' operations, where a plastic tube is implanted into the anterior chamber of the eye. The tube then drains the aqueous fluid directly out of the eyeball. Potential complications include erosion of the tubes and eye movement problems. The 4 main shunts are the Ahmed, Baerveldt, Krupin and Molteno implants. At the conclusion of surgery, a pad or a clear shield or both is usually put over your eye to protect it. It is a good idea to wear the shield at night when you sleep at least for one or two weeks after surgery. It can be cumbersome and slightly uncomfortable, but it will help to prevent accidental rubbing and trauma to the eye. 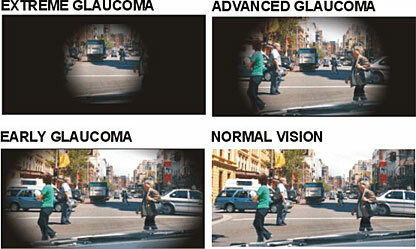 The day after glaucoma surgery, your vision will probably be more blurry than before surgery. This is to be expected, and generally will improve as the eye settles over the next few weeks. Your eye will likely feel uncomfortable, itchy or as if there is something in the eye; try to resist the temptation of rubbing or scratching the eye. This sensation may be due to the fine stitches that have been placed in the eye. If absorbable stitches are used, they will dissolve by themselves after a few weeks. Non-absorbable stitches may need to be removed after a few weeks, but sometimes they can be left in the eye without causing any problems. Eye pressure too high: This may be because some of the stitches in your eye have been tied too tightly, reducing the ability of aqueous to flow out through the newly-created drainage channel. When these stitches are adjusted, released or cut with laser (suturelysis), aqueous should be able to drain more easily, thereby lowering the eye pressure. If scar tissue is stopping aqueous drainage, then an injection of anti-scarring agent (usually 5-fluorouracil) is usually given to reduce the amount of scar tissue. Sometimes, a needling procedure may be needed to clear the scar tissue and re-establish the drainage pathway. In the case of non-penetrating surgery, you may need to undergo laser goniopuncture to create a new channel to allow the aqueous to drain out of the eye. Left: A bleb needling procedure in an eye that had undergone trabeculectomy surgery (the red circle indicates the entry site of the needle). Eye pressure too low: Your eye may need reinflation with viscoelastic, which is a viscous jelly-like substance that will temporarily maintain your eye volume and pressure. Uncommonly, you may need to return to theatre for resuturing of the wounds in your eye. During the first few weeks after glaucoma surgery, you will need to put both steroid and antibiotic drops in your eye. The antibiotic is to prevent infection, while the steroid is to reduce the inflammation in the eye. However, you may have to continue with the steroid eye drop for a good few months. The steroid acts to reduce inflammation and subsequent scarring, and this reduces the risk of the surgery failing. Your course of steroid eye drops may have to be prolonged if your eye has a tendency to scar after glaucoma surgery. Although effective at lowering eye pressure, glaucoma surgery is also associated with surgical complications. If you are concerned about how your eye is feeling after surgery, you should contact your ophthalmologist to arrange an eye examination.